I love that chickpeas are so versatile. You can roast them, toss on a salad, add to a stew and highlight in a vegetarian main dish. Chickpeas are very well rounded, they practically have it all – plant protein, complex carbohydrates, fiber, vitamins and minerals. In other words, chickpeas will give you slow burning energy, keep you satiated (fuller for longer) and not spike your blood sugar. Along with other legumes, they are a great source of folate, typically associated with dark green veggies. One of the most popular chickpea creations is hummus. You’ll find numerous flavors at any grocery store but homemade is always best. I have whipped up this recipe over and over again; and it’s always a hit. I recently served it to 700+ people at an employee wellness fair and it did not disappoint. Even those who were scared to try it, came back for more! Tips: If you’re using canned chickpeas, don’t pitch the chickpea juice known as aquafaba. Use it to reach your desired consistency and definitely do not add water. Some brands contain more chickpeas than others so you may not need as much aquafaba. Also, you can use sun-dried tomatoes that are dry in packages or jarred in oil. Add all of the ingredients to a food processor and process until fairly smooth. If you like it very smooth and “fluffy”, keep the processor spinning and add a tad more aquafaba. To serve, sprinkle with extra virgin olive oil and maybe little paprika. If you’re gluten free, skip the pita and pair with an array of cut fresh veggies. Enjoy! What can I use in lieu of the chickpea juice? where can I buy it. Thanks! Hi, Thank you for asking. The juice is the liquid that comes in the can of chickpeas or the leftover liquid if you are boiling dried chickpeas. Does that help? Thank you Michelle. I am sure one day I am going to make it. 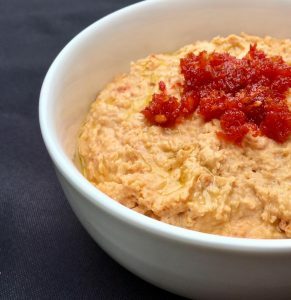 I have made Hummus dip before but never added sundried tomatoes. It was very good. Thanks a lot for sharing. Awesome. Let me know how it turned out. You’re welcome Anna. When you make it, let me know how it turned out.